Expansion project: By 2022, German Aldi and its compatriot Lidl will have favoured the UK with more than 2,000 of these little discount huts. Aldi Süd in the UK has launched what it calls its largest ever recruitment drive. The German discount retailer has said that it is to create nearly 4,000 jobs as it presses ahead with its aggressive expansion strategy. The grocer, which has more than 700 stores in England, Scotland and Wales, but none in Northern Ireland; saw 900,000 new customers walk through its sliding doors last year, according to Managing Director Matthew Barnes. The new jobs will mostly be at store level and follow what the company has described as “a surge in sales”. Barnes claimed that Aldi was the UK’s highest-paying grocer, paying all shop workers at least GBP 8.53 (EUR 10.41) per hour. 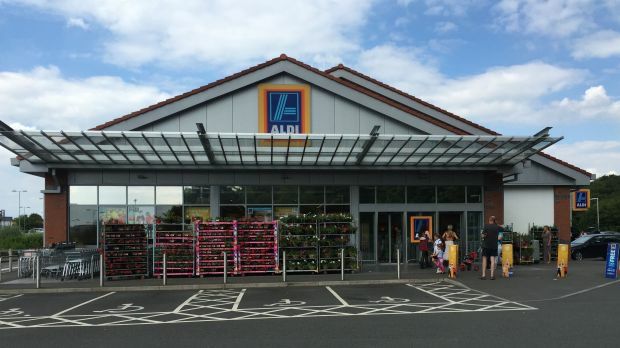 Following decades of marginality, Aldi and its competitor Lidl have seen a breakthrough in customer acceptance in the last couple of years in the UK market, resulting in fantastic growth rates for both retailers. Aldi Süd said it remained on course to reach 1,000 stores in the UK by 2022. Just a day or so after arch rival Lidl declared an acceleration of its expansion plans for the UK, Aldi then releases another record-making media statement. Of course, it is all about attracting attention, jumping on the bandwagon of positive press that the discounters are currently enjoying, while the local matadors such as Tesco are suffering – not so much economically, but in terms of public perception. It was that negative perception, combined with a simple lack of presence, that nourished prejudices and prevented many Brits from trying out these cheap shops in the beginning. Now they are savouring the opposite and are making extensive use of it. Furthermore, when looking for staff, you cannot search more broadly than through the media – and completely for free; the discounters are particularly fussy as their requirements are different from other supermarkets’. Finally, it is always a clever idea to keep the press, especially the British tabloid press, well-disposed towards you. The more you tell them, the more they will exalt you – it’s a game of mutual dependence. If you don’t stick to the rules, you may end up like the European Union. Ousted. In the light of all the euphoric growth targets, there has been some confusion about the store targets of the discounters. Aldi was temporarily reported to plan to open 1,700 stores by 2022, up from 1,000 or 1,300. The first is not realistic, as it would mean adding 1,000 stores in five years – something a prudent, cautious, perfectionist company like Aldi Süd wouldn’t do and wouldn’t manage. But adding 50-60 outlets is realistic. And explains why Lidl increased its store opening targets just the other day to very much the same amount. As if there was no e-commerce, it is a mundane race for stores. Not so much between the Big Four (Tesco, Sainsbury’s, Asda, Morrisons) and the discounters but between Aldi and Lidl themselves. And there is nothing wrong with that, because there is no other discount market that is as under-served as the UK, with the possible exception of the US. But other than in the US, the sales densities are extremely high: an Aldi store makes more than GBP12mn (EUR 14.6mn) per year – far more than in any other Aldi market. In the US, Aldi generates the same turnover as in the UK – but with double the store count. So it makes absolute sense to expand as fast as possible simply because the market is far from saturated - supply cannot even meet demand currently. According to LZ Retailytics’ cautious forecasts (cautious meaning: we don’t want to swim with the currently prevailing discounter hype in the UK), Lidl will generate sales of GBP9.8bn (EUR 12bn) in 2022 with just over 1,000 stores; up from GBP8.2bn (EUR 10bn) if it had taken a slightly more modest path. Aldi Süd will have GBP14.3bn (EUR 17.5bn) in gross sales in 2022, the same year as it also plans to have 1,000 UK stores – or more. But this, of course, will not be the end.